Originating in Wales, the Cardigan Welsh Corgi is similar to the Pembroke Welsh Corgi. 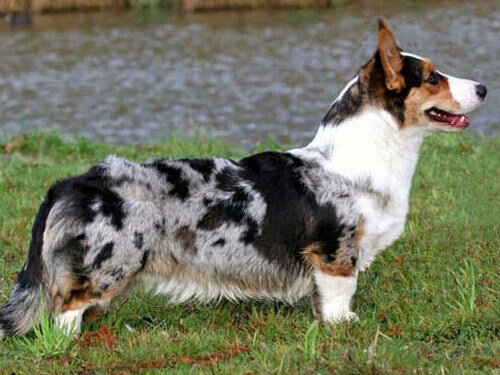 However, the Cardigan Welsh Corgi is considered to be the older of the two varieties. Bred to drive cattle, guard the farm, and hunt vermin, this breed was also an integral part of the family. This breed is relatively rare but is continuously and consistently gaining public recognition. A small yet hardy breed, the Cardigan Welsh Corgi has a fox-like face and is long and low in build. They are extremely versatile in both thought and action. They possess strength, endurance, and speed. A handsome and powerful breed, the Cardigan Welsh Corgi is also dependable, trustworthy, loyal, and affectionate. The Cardigan Welsh Corgi has an endearing and delightful personality. This breed is highly intelligent, sensible, alert, and courageous. They thrive on human companionship and are deeply devoted to their family. They are wary of strangers and will guard and protect their family and territory. This breed is best suited for a family with older considerate children. The Cardigan Welsh Corgi gets along well with non-canine pets and with other Corgis, but has a tendency to be aggressive with other dogs. Caution, care, and control must be used with this breed to keep them safe from harm when they are in defense mode. As members of the herding group they will attempt to perform this task with everyone and anything that moves. This breed requires minimal grooming. They should be brushed with a firm bristle brush on a regular basis. During their heavy shedding period they should be brushed and combed daily. Bathing should only be done when absolutely necessary using a mild shampoo. The Cardigan Welsh Corgi is prone to such health problems as progressive retinal atrophy, glaucoma, cataracts, and back problems. The Cardigan Welsh Corgi is a double coat breed. The outer coat is harsh, straight, water resistant, and of medium length. The under coat is dense and soft in texture. The hair is more profuse around the neck, the underside of the tail, and the backs of the legs. The coat comes in a variety of colors such as sable, red, brindle, black, blue merle, black and tan, and black and brindle. The coat also has white markings. The Cardigan is a constant shedder with heavy bi-annual shedding. Eager to please and very obedient, the Cardigan Welsh Corgi benefits from early socialization and basic obedience training. The crate training method is recommended for housetraining this breed. They excel in agility, herding trials, tracking, conformation, obedience, and love to learn and perform tricks. The Cardigan Welsh Corgi is also used extensively as a therapy dog and in search and rescue. This breed requires daily exercise such as a securely leashed walk, family play session, or a romp and run in a fenced yard. They are moderately active indoors. The Cardigan Welsh Corgi will do well in an apartment or condominium dwelling provided they are given sufficient exercise, companionship, and stimulation.